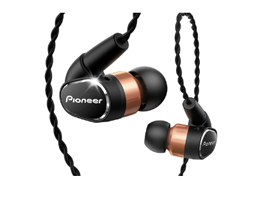 Push Mobile Hi-Res Audio to the Limit: the SE-CH9T from Pioneer, a premium dynamic headphone delivering immersive Hi-Res Audio in comfort. Original drivers developed for Hi-Res Audio reproduce frequencies between 5 Hz–50 kHz, allowing the true harmonic character of audible sound to be reproduced while restoring a sense of spaciousness to your music. Airflow Control Port assists by separating mid- and low-frequency bands, bringing the richness of vocals to life in stunning detail. Nozzles are of brass-and-aluminum construction to prevent resonance, serving controlled, punchy bass in any music played on smartphone or Digital Audio Player. Inline mic and controls, detachable over-the-ear cables, and reinforced ear tips make these headphones a comfortable choice for high-definition sound on the go.